We thank Kate Gordon, Kurt Schuparra, and Jessica Halpern-Finnerty for comments on this report. We also thank Bob Johnson for providing us with data and background information about school classified employees in California. All errors and omissions are the sole responsibility of the authors. Proposition 39 allocates up to $550 million per year for five years for energy efficiency and clean energy projects in California’s public schools, community colleges, universities, and other public facilities. It also provides funding for workforce training in energy efficiency and clean energy. This report estimates the job and workforce impacts of Proposition 39 investments, including the occupational mix of jobs and the number of entry-level positions. It presents information on workers in two key sets of occupations: the building and construction workers who will be engaged in energy efficiency retrofits and clean energy installations, and the school facilities personnel who can reduce energy use through improved operations and maintenance of buildings and their systems. The report also identifies potential training needs for the construction and school facilities workforce and estimates the number of workers that may require training for Proposition 39-funded projects. It also presents recommendations on program elements that can help ensure good jobs and workforce outcomes. Proposition 39 investments will create an estimated 3,410 direct person-year jobs and 7,843 total person-year jobs annually, including indirect and induced jobs, if $550 million is used for energy efficiency retrofits distributed via grants. 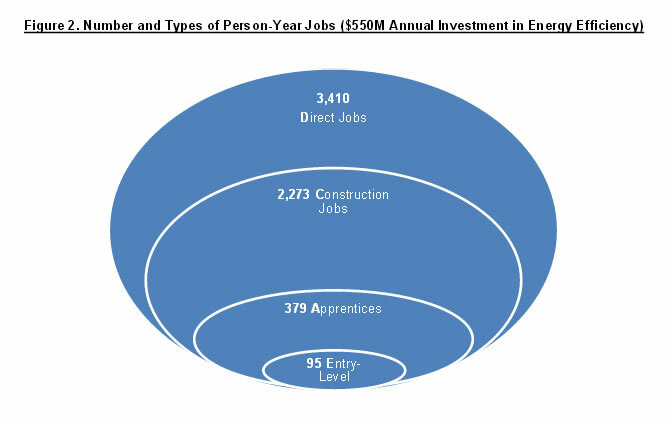 We use a conservative rule-of-thumb of 6.2 direct person-year jobs per million dollars of investment in energy efficiency retrofits and a 2.3 employment multiplier for these estimates, and present caveats in the report. A person-year job is defined as one full-time, one-year job–not one permanent job. If some of the funds are spent on renewable energy installations, the number of direct jobs is likely to be slightly smaller and the total stimulus slightly larger due to a larger estimated multiplier. Leveraging additional financing for energy retrofits and clean energy installations with a portion of the Proposition 39 funding would add jobs in direct proportion to the size of the increased investment. We use a conservative multiplier of four for the increase in total investment that could be leveraged from a revolving loan fund, based on a recent UCLA/LABC study. Creating a $50 million dollar revolving fund would result in an estimated total investment of $700 million and an estimated 4,340 direct jobs; creating a $100 million dollar revolving loan fund would result in an estimated investment of $850 million and an estimated 5,270 direct jobs. An estimated two-thirds of the direct jobs (or 2,273 jobs) will be in skilled construction trades occupations; one-sixth will be in professional and managerial occupations such as architects, engineers, project managers, and contractors; and only two percent will be in specialized energy occupations such as energy auditors. Proposition 39 retrofits will create an estimated 1,894 journey-level and 379 apprentice jobs annually in the trades. Proposition 39 retrofit projects will create an estimated 95 entry-level, first-year apprentice jobs annually in the construction trades. California can leverage its rich and extensive existing training infrastructure to meet the training needs for carrying out Proposition 39 projects successfully. Construction trades workers on Proposition 39 projects will be trained via the state’s key asset for training construction workers, the state-certified apprenticeship system. These four-to five-year training programs are largely self-funded by employers and workers. There will be some need for funding for pre-apprenticeship training programs (which generally do not have dedicated funding sources) to prepare disadvantaged workers for apprenticeships, but this need is limited because of the low number of entry-level job openings. The U.S. Department of Labor’s new guidance on pre-apprenticeship programs and AB 554 (2011) provide a standard to assess effective pre-apprenticeship programs. Further research is needed to determine whether journey-level workers need any upgrade training for new energy-saving technologies that go beyond code. There are up to 30,000 school maintenance and operations workers across the state whose responsibilities affect the energy performance of school buildings. Existing training partnerships and curricula provide building blocks for expanded training for energy efficient building operations and maintenance. Effective pre-apprenticeship programs that are linked to and aligned with state-certified apprenticeship programs. However, given the small number of expected entry-level job openings, this investment should be limited. Energy efficiency and renewable energy training for incumbent school employees responsible for the maintenance and operation of school facilities, to ensure that workers can properly operate systems and equipment to achieve the full potential of energy savings. If policymakers decide to expand funding for job training beyond what is needed for implementation of Proposition 39 projects, these investments should align with other state workforce development investments and use existing programs to create pathways for disadvantaged workers into career-track jobs and/or further training and education. Training investments should include performance goals and track relevant information including completion and job placement rates, wages, and retention. Proposition 39 should adopt responsible contractor requirements that include the use of apprentices and journey-level graduates from state-certified apprenticeship programs. If needed, specialized certifications for new “beyond-code” technologies should also be required. Where project labor agreements with targeted hire goals already have been adopted, Proposition 39 funds should be subject to them, as they have a strong track record of facilitating the hiring of disadvantaged workers. Preference should also be given to retrofit and installation projects that adopt such agreements. Funding for enforcement of the public works section of the California Labor Code and Proposition 39 programs should be sufficient to ensure compliance with prevailing wages and other standards. The Labor and Workforce Development Agency should oversee the jobs and training aspects of Proposition 39 program development to ensure alignment with other ongoing state efforts and to help maximize the jobs benefits. Proposition 39,2 approved by voters in November 2012, allocates up to $550 million per year for five years for energy efficiency and clean energy projects in California’s public schools, community colleges, universities, and other public facilities. In addition to its goals of reducing the use and cost of energy for these facilities, Proposition 39 states that funds should “create good-paying energy efficiency and clean energy jobs in California.” It also includes the goal of training and employing disadvantaged youth, veterans, and others for jobs in these sectors. We begin by describing eligible Proposition 39 projects and identifying the businesses and industries that will be engaged in this work. We then estimate the number of jobs created by Proposition 39 under various scenarios, based on available research about the job impacts of energy efficiency and renewable energy investments. Next, we examine the related occupations and workforce, focusing on workers in two key sets of occupations that are critical to lowering energy use in schools: the construction workforce who will install energy retrofit and clean energy projects and the incumbent school facilities personnel responsible for maintenance and operations. Finally, we identify potential training needs for the construction and school facilities workforce and estimate the number of workers that may require training for Proposition 39-funded projects. Proposition 39 provides funding for energy efficiency retrofits and clean energy installations, along with related improvements and repairs that reduce operating costs, improve health and safety conditions or provide other environmental benefits for schools, colleges, universities, and other public buildings. Eligible expenditures also include workforce training for energy efficiency and clean energy careers, and public/private financing instruments to leverage additional funds for Proposition 39 projects. 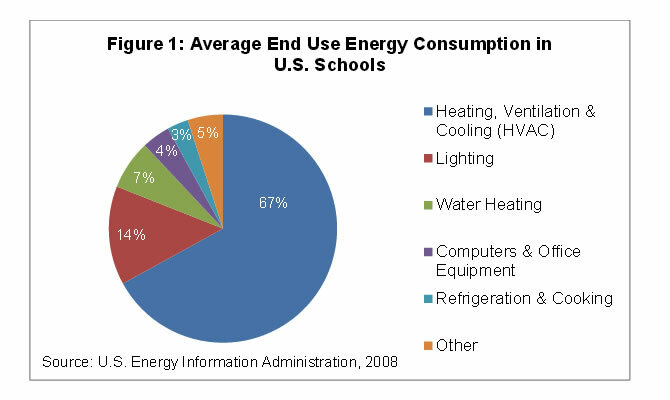 Figure 1 shows national data on the distribution of energy usage in schools, illustrating that a full two-thirds of total energy consumption in schools is used by the heating, ventilation and cooling (HVAC) systems.7 Lighting, the next largest source of energy consumption, uses on average 14 percent of the energy consumed in schools. Upgrades to HVAC and lighting systems, as well as improvements to the building envelope such as insulation and window improvements, are critical for lowering energy use in schools. Energy efficiency retrofits and renewable energy installations fall squarely within the building and construction industry and are performed by general and specialty construction contractors and their skilled construction trades workers. These companies either contract directly with school districts or are subcontracted by energy services companies (ESCOs) who enter into energy performance-based contracts with school districts or other entities. ESCOs generally provide a turn-key service in which the ESCO assumes at least part of the risk and reward of energy efficiency investments and often provides financing, auditing, subcontracting of installation work, and other services. Improving the operational efficiency of buildings also provides a critical opportunity for reducing energy use and costs. Improvements in the operation of building systems, such as HVAC and lighting, can reduce energy consumption by an estimated five to twenty percent for an existing commercial building.8 Operations and maintenance practices are the day-to-day activities needed to keep a building operating effectively and keep building users comfortable and safe. Energy efficient practices include monitoring energy use, adjusting and properly maintaining equipment, and running the building’s lighting, HVAC, and other mechanical systems in alignment with the building’s operating hours and occupancy levels. 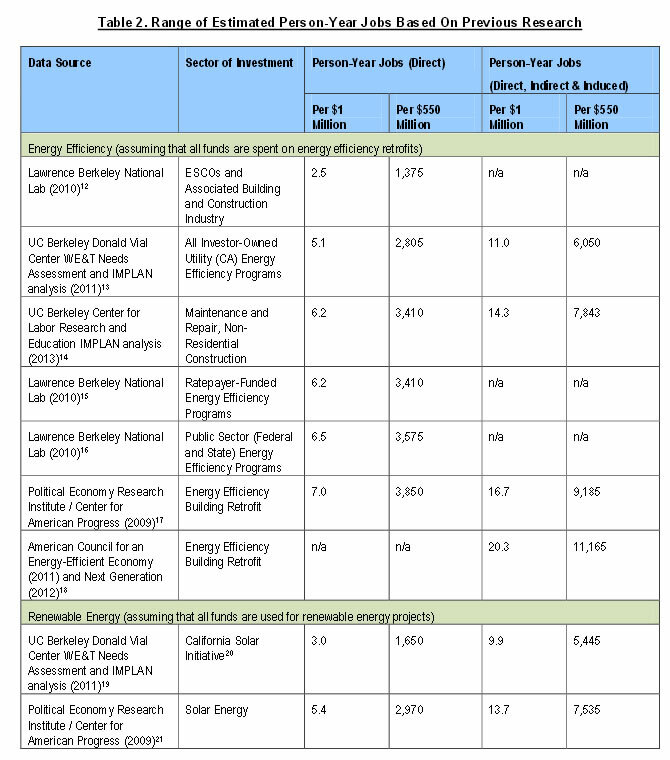 Our job forecast analysis, summarized in Table 1, suggests that about 3,410 direct jobs per year will be created if Proposition 39 funds are all used on a grant program for energy efficiency retrofits. We derive this number using a conservative rule of thumb, based on our review of existing research, that 6.2 jobs are created for every million dollars of investment in energy efficiency retrofit work. We forecast that roughly 7,843 jobs in total will be created, including the indirect and induced jobs. We derive this number using a conservative multiplier of 2.3, also based on our review of existing studies which use IMPLAN, a commonly-used economic multiplier model. If some of the funds are spent on renewable energy installations, the number of direct jobs is likely to be slightly smaller and the total stimulus slightly larger due to a larger estimated multiplier. If some of the funds are used to leverage other public or private investment, the number of jobs created will grow directly in proportion to the amount of total investment generated. Job forecasting is not an exact science, and should be viewed with caution. Below, we provide a detailed explanation of our assumptions, data sources, and definitions of terms. Table 2 presents our source materials from previous research and the authors’ analysis. For simplicity’s sake, our forecast is based on a $550 million dollar per year investment via direct grants for eligible projects. The Proposition allows for 4 percent ($22 million) for administration, and an undetermined amount for planning, technical assistance, and workforce training. Job projections would probably rise slightly if we specifically allocated $50 million per year for administration, technical assistance and workforce training because these labor intensive activities result in a higher number of jobs per million dollars of investment.9 However, there is insufficient information to warrant this additional refinement of our estimates. The studies listed in Table 2 estimate the jobs created per million dollars of investment in energy efficiency and renewable energy, and are scaled up to estimate the impact of Proposition 39. These studies use a variety of methodologies and data sources, and include investments in a number of different building types. None of these studies have specific information on the jobs created by investments in school retrofits for California. Job numbers can vary significantly depending on the type, size, age, and maintenance history of a building as well as the type of retrofit work that is carried out.10 As a consequence, and as Table 2 illustrates, the job projections vary substantially. Job creation is expressed in person-year jobs, defined as one full-time, one-year job–not one permanent job. Estimates for direct jobs are considered quite reliable as they are generally derived from federal government data collected in large surveys of firms. Moreover, their accuracy can be checked if jobs are tracked during program implementation. Estimates of direct jobs are critical for determining training needs. Forecasts of total jobs including the multiplier effect are less reliable as they model the interaction effects within the economy. However, particularly in cases such as this one where Proposition 39 brings in revenues that would otherwise be spent outside the state, indirect and induced effects are likely to be significant. The studies cited in Table 2 provide a range of estimates of the job creation potential from Proposition 39 investments. If all funds are spent on energy efficiency retrofits, the studies suggest a range between 1,375 and 3,850 direct person-year jobs will be created annually. The estimates for ESCOs indicate the smallest number of jobs by far. It is not clear whether this is due to the very small sample of interviews from which this data is derived, or because ESCOs obtain greater revenues per worker by capturing the value of the energy savings. For the total jobs created by energy efficiency projects, including the indirect and induced jobs, the studies suggest a range of 6,050 to 11,165 person-year jobs. Table 2 also provides job estimates if all Proposition 39 funds were spent on solar energy installations, showing fewer direct jobs per million but a greater multiplier effect. Projects eligible for Proposition 39 funding may ultimately include a mix of energy efficiency and renewable energy components. If the investments in retrofits or renewable energy lead to substantial savings on utility bills, the recipient entities can redirect these funds each year. These redirected funds will create jobs as well. The studies listed above do not incorporate this type of induced job impact, which could increase the multiplier. If all K-12 public schools could be retrofitted and were able to save, on average, 25 percent of the $700 million they spend in aggregate on energy, $175 million per year could be allocated for other purposes. This would create additional induced jobs. As Proposition 39 is implemented and energy savings and costs are tracked, it will be possible to estimate the job-creating potential of these redirected funds as well. Proposition 39 investments could create a substantial number of additional jobs, if some of the funds are used to leverage additional financing for energy efficiency retrofits and clean energy installations. A recent study by the UCLA Luskin Center for Innovation and the Los Angeles Business Council Institute (UCLA/LABC) estimates that a revolving loan fund capitalized with $50 million per year from Proposition 39 investments could result in four times the total investment dollars than would be available from a direct grants program.22 The jobs created would also be quadrupled, as the number of jobs would be expected to grow in direct proportion to the size of the resulting investment. Proposition 39 is covered by prevailing wage legislation and therefore is set up to create good jobs with benefits. Additional responsible contractor requirements to encourage the hiring of experienced contractors and ensure that the workforce is adequately trained can also contribute to successful outcomes. Requiring that contractors participate in state-certified apprenticeship programs can guarantee that the workforce is highly-trained. Specialized certifications for installation of “beyond code” new technologies may also be of value. Construction trades jobs are perceived as accessible entry points for disadvantaged workers because they do not require a college degree but can provide, at least in the unionized sector, a career-track, middle-class job. Entry into public works and most career-track construction jobs occurs through acceptance into an apprenticeship program. Building energy performance is based in part on the daily actions of maintenance and operations staff including those working in California’s roughly 1,000 school districts and 10,000 schools.31 For example, custodians (typically the first employees to arrive on campus) can improve energy savings by turning on lights and air conditioners in a staggered fashion throughout a building to prevent high start-up currents and minimize peak electricity demand usage.32 School custodians and maintenance workers can therefore play a critical role in ensuring that Proposition 39 projects achieve maximum potential energy savings.33 Facility managers and/or skilled trades workers also play an important role in reducing energy use and costs. Job classifications and staffing patterns for these roles vary widely across schools and districts, depending on school size and other factors. In smaller school districts, a worker may perform two distinct jobs and therefore have a title such as Bus Driver/Custodian. Among Soledad Unified’s 18 maintenance and operations staff, for example, 11 are full-time custodians but eight of them split time between custodial and bus driving duties.34 Larger school districts typically have more specialized staff; in San Diego Unified, for example, there are 770 maintenance and operations staff including 295 full-time custodians.35 Given this variability, it is difficult to precisely identify the set of school employees who could improve energy savings if they received more training. Proposition 39 requires that some funding be allocated to workforce development programs to train and employ disadvantaged youth, veterans, and others on energy efficiency and clean energy projects. This section assesses the need for new investment in workforce training for workers in jobs created by or affected by Proposition 39 investments. Proposition 39 does not limit training investments to workers employed on Proposition 39 projects; additional opportunities exist for effective investments in training for careers related to energy efficiency and clean energy occupations, and will be discussed at the end of this section. Career pathways and training in the construction trades are well developed for public works construction. State-certified apprenticeship programs are the main vehicle for long-term, advanced training for these jobs and incorporate numerous industry-recognized certifications. Apprenticeship is an “earn-while-you-learn” model that provides immediate employment. On-the-job training is combined with technical classroom instruction provided by affiliated community colleges or adult schools. As apprentices advance in their training and acquire more skills, their wages increase accordingly. State-certified apprenticeship is a system of self-funded industry training partnerships, in which multiple employers make a joint investment in training workers to meet industry demand. In the unionized sector, employers and employees each contribute a specific amount for each hour worked to a Taft-Hartley training trust fund. For the non-union programs, the employers make a unilateral contribution. The self-funding mechanism makes apprenticeship sustainable and helps ensure its value to both workers and employers. Employers tailor training to the demands of the marketplace, including new technology adoption and changes in building code. This benefits trainees as well, because the skills they learn are valuable and marketable. There are still gaps even in this very robust training system. Workers need strong basic skills, which high schools do not always provide, to successfully apply for and complete apprenticeship programs. Pre-apprenticeship programs have emerged to help fill this gap and are an important vehicle for providing a pipeline for people from disadvantaged communities into apprenticeship. Unlike apprenticeship, pre-apprenticeship programs do not have a mechanism for self-funding, so irregular funding can be a barrier to the success and sustainability of these programs. It is also critical that funding goes to effective pre-apprenticeship programs. The term “pre-apprenticeship” has been used to describe a wide variety of programs with a very mixed record in placing workers in career-track jobs.40 The U.S. Department of Labor (DOL) has recently released new regulatory guidelines that identify specific characteristics that define effective pre-apprenticeship programs. These include a documented partnership with at least one certified apprenticeship program to insure tight coordination on timing, need, and curriculum.41 Recent state legislation (AB 554, 2011) echoes this intent to align training by requiring that pre-apprenticeship programs funded with Workforce Investment Act funds be conducted in coordination with one or more certified apprenticeship programs. California has a wide array of pre-apprenticeship programs that may or may not meet the new DOL guidelines or the intent of AB 554. Pre-apprenticeship programs are run by wide variety of entities, including non-profit organizations, community colleges, high schools, and apprenticeship programs themselves. They are funded with a variety of temporary federal, state, and foundation funds. Proposition 39 names both YouthBuild42 and the California Conservation Corps (CCC) as two possible recipients for training investments. YouthBuild is a federally-funded, locally-designed program in which low-income young people (ages 16-24) work full-time for six to 24 months learning job skills by building affordable housing in their communities while working toward their GEDs or high school diplomas.43 CCC is a state program with affiliated local programs targeted to youth; its main focus has been employing young people (ages 18 -25) to work outdoors for one year to improve California’s natural resources.44 Other examples of pre-apprenticeship programs include Helmets to Hardhats,45 which targets veterans, and a number of local programs, such as RichmondBUILD46 and the Cypress Mandela Training Center,47 that assist women and ex-offenders as well as youth, and high school-based programs such as the Los Angeles Unified School District “We Build” program48. At this time, there is insufficient information to assess which pre-apprenticeship programs, whether run by community colleges, high schools, YouthBuild, CCC or other entities, meet the DOL guidelines or the intent of AB 554. In addition to preparing a pool of qualified entry level workers, policies that impact contractor hiring decisions may be needed to ensure their placement.51 Targeted hire goals that are incorporated into project labor agreements are another way to facilitate the hiring of disadvantaged workers. Targeted hire increases access to construction jobs for veterans, local residents, and other disadvantaged populations by requiring that a certain percentage of workers are hired from targeted populations. Finally, there may be a need for skills upgrade training for incumbent journey-level construction workers for new “beyond-code” technologies. Journey-level workers have opportunities to learn new skills and keep up-to-date on the latest technology through journey upgrade classes offered through the apprenticeship program or the union, and employers have a strong incentive to make sure that training offerings are up-to-date. Nevertheless, there can be a lag time for upgrading curriculum as the most cutting-edge energy efficiency and renewable energy skills and technology penetrate the market. Proposition 39 is an opportunity to fill training gaps and potentially build career pathways for maintenance and operations workers in California’s schools. In the past, some school districts provided training to maintenance and operations staff but most of these training programs have been eliminated over the years due to budget cuts.54 The California School Employees Association (CSEA) represents about two-thirds of school classified employees statewide and offers annual training courses for maintenance and operations workers through its Maintenance and Operations Skills Development Academy.55 This represents an existing infrastructure that is linked to a large portion of the workforce.56 The Service Employees International Union (SEIU), which represents around one-third of school employees across the state, also has experience in training custodians and other facilities personnel through its labor-management training partnerships. The Building Operators Training and Certification program offered by the state’s Investor-Owned Utilities may also be a relevant resource. Leveraging all of these existing resources will require planning and coordination. Table 5 estimates annual training needs for key categories of school maintenance and operations workers. These annual training estimates provide an upper limit on the number of workers needing training based on the number of estimated workers statewide (see Table 4), assuming all employees would need some amount of training and that training would occur over the five years of Proposition 39 funding. If policymakers determine that Proposition 39 training funds will be used more broadly than training needed for the successful implementation of Proposition 39 goals, there are ample opportunities to invest in programs that have a track record in helping disadvantaged youth and others. This should include not only pre-apprenticeship programs for construction, but also programs that help disadvantaged youth (and older workers) finish high-school and/or continue to college, and/or gain employment in other living wage jobs. In occupations related to clean energy and energy efficiency, pipelines into living wage careers include professional careers such as architecture and engineering as well as some white collar sales and other middle-skilled jobs. Earn-while-you-learn models like YouthBuild57 and the CCC are important programs that can start workers on a career path. They should be seen as the first step on a ladder of training and employment leading to a variety of middle-class careers. Summer youth employment programs are another important model because of their focus on school drop-out avoidance and recovery. Recent summer jobs programs in Los Angeles are promising because they include explicit incentives and supports for continued education for participants58. The California Partnership Academies, high school career technical programs serving at risk youth through drop-out avoidance and support for multiple career pathways, are also a critical part of the state’s existing infrastructure. Programs for disadvantaged workers and students are most successful when they link their graduates to specific and real opportunities for further education, apprenticeship training, or career-track employment. Construction should thus be seen as only one pathway to help targeted groups get career-track jobs. Many experienced construction workers are still “on the bench” due to the 40 percent drop in employment in the construction industry from peak employment in 2006. Although the construction industry is starting to recover, many apprenticeship programs are just beginning to accept new applicants after a period of limited or no openings.59 To assess the need for funding for pre-apprenticeship programs beyond those needed for Proposition 39 projects, data is needed on the number of slots that will open in state-certified apprenticeship over the next five years and the current capacity of effective pre-apprenticeship programs in California. Proposition 39 is a large investment in energy efficiency and clean energy in California, allocating $550 million per year for five years for energy retrofit projects in the state’s schools and other public entities. The law has multiple goals that include saving energy, reducing utility bill costs, and job creation. The directive on jobs in Proposition 39 specifies the importance of “good paying” jobs and improving access to good jobs for disadvantaged workers. Policymakers are now grappling with how best to weigh the trade-offs inherent in alternative approaches which emphasize one or another of these multiple goals. We hope this report can inform this decision-making process by clarifying the likely job and workforce impacts and the policy tools that can influence them. Readers may be surprised at our relatively small job forecasts, which are based on our conservative rule of thumb that 6.2 direct jobs are created for every million dollars of investment. Policymakers have little influence over the number of jobs per million dollars of investment in any industry, because this is largely determined by its capital-intensity or labor-intensity. The only significant tool policymakers have to increase the number of jobs created by Proposition 39 is to use some of the funds to leverage a larger investment pool for energy efficiency and clean energy work. The larger the total investment, the greater the number of jobs created. The benefits of leveraging on job creation should thus be part of the calculus of the pros and cons of leveraging vs. direct grants. Given the difficulties of forecasting jobs and the wide range of estimates reported here, we urge policymakers to require data tracking on the actual number of jobs as part of the program’s reporting requirements. As far as the goal of good-paying jobs, Proposition 39 is likely to be successful because this funding falls under the state’s prevailing wage law. If enforcement is adequate, middle-class construction jobs will be created. Apprenticeship standards ensure that skilled workers are hired who can perform proper installations and service, leading to high performance and persistence of energy savings. A bigger challenge is how to address Proposition 39’s goal to help disadvantaged workers obtain employment in good-paying energy efficiency and clean energy jobs. Our research reveals that job openings for entry-level workers on Proposition 39-funded retrofit and installation projects will be limited. We estimate that only about 100 entry-level, first-year apprenticeship slots will be created if funding is distributed via grants. Leveraging can help create additional entry-level jobs but the number will still be small. While the apprenticeship structure is extremely effective in imparting skills to entry-level workers and moving them into middle-class careers, contractors need to maintain a workable ratio between fully-skilled journey-level workers and new apprentices. This restricts the number of entry-level workers who can be hired at any given level of investment, even with the strongest targeted hire policies and workforce preparation programs. Effective workforce training and education, including earn-while-you learn opportunities, do exist for disadvantaged youth and others, beyond those arising from jobs in the specific energy efficiency and clean energy projects funded by Proposition 39. These programs, if effective, can help create pipelines into career-track jobs in construction and other sectors, including into higher education and professional jobs. To that effect, funding can align with and leverage California’s rich and extensive existing training infrastructure. Much has been learned about what constitutes effective training and education in occupations related to energy efficiency and clean energy and these lessons can be applied as criteria for funding decisions on workforce development. This report also calls attention to the incumbent workers already employed by school districts, who are critical to the energy savings goals of Proposition 39. School custodians, construction trades workers, and facilities managers all have a role to play in school energy use and many could benefit from training. Proposition 39 is an opportunity to fill training gaps and potentially build career pathways for facilities and operations workers in California’s schools and other eligible entities. In conclusion, policymakers and program implementers have a set of tools to influence the quantity and quality of jobs created by Proposition 39, and training and job opportunities for disadvantaged Californians. Decision-makers can also help ensure that workers in all the installation, maintenance, and operation jobs that impact energy use have the skills and knowledge to improve the energy performance of our schools and buildings. A thoughtful approach to the jobs and workforce development aspects of Proposition 39 implementation can help achieve California’s energy and workforce goals in tandem. For a more detailed explanation of these recommendations, see Carol Zabin, Recommendations for Prop. 39 Implementation: Jobs and Workforce Development Program Elements, Donald Vial Center on Employment in the Green Economy, University of California, Berkeley, (May 7, 2013). http://www.irle.berkeley.edu/vial/publications/prop39_program_recommendations.pdf. IMPLAN 3.0 (2010 California data) shows approximately 10 direct jobs per million and 20 total jobs including indirect and induced for expenditures by state government. Ideally, estimates of induced jobs would also include those resulting from redirecting funds previously allocated to utility bills to other spending by schools, but we were unable to estimate this given time and resource constraints. Charles Goldman et al. Energy Efficiency Services Sector: Workforce Size and Expectations for Growth (Ernesto Orlando Lawrence Berkeley National Laboratory, September 2010), pages 55-58, http://emp.lbl.gov/sites/all/files/REPORT%20bnl-3987e.pdf. ESCO workforce information is based on interviews with nine ESCOs. It reports only direct employment effects, and does not include a multiplier for indirect or induced jobs. Zabin et al., California Workforce Education and Training Needs Assessment for Energy Efficiency, Demand Response, and Distributed Generation, University of California, Berkeley (2011). Job estimates reported here are derived from estimates of jobs per million of the industry mix from IOU energy efficiency investments reported in Appendix D. See http://www.irle.berkeley.edu/vial/publications/WET_Part1.pdf, Chapter 3 and Appendix D. Calculations were performed by Bill Lester, University of North Carolina and used IMPLAN 3.0 (2010 California data). UC Berkeley Center for Labor Research and Education analysis of IMPLAN 3.0 (2010 California data) conducted by Laurel Lucia. Goldman et al. (2010), pages 24, 51-55, 58. Workforce data for ratepayer-funded energy efficiency programs is based on interviews with program administrators and implementers, program evaluations, and other sources. Goldman et al. (2010), pages 25, 51, 58. Workforce data for government energy efficiency programs is based on FY 2010 federal budget appropriations and employment (FTE) for federal and state energy efficiency programs (excluding ARRA investments and the Weatherization Assistance Program) funded through the Department of Energy, Energy Efficiency and Renewable Energy division, along with workforce data for state energy offices from a 2009 study by the National Association of State Energy Officials. Robert Pollin, James Heintz, and Heidi Garrett-Peltier, The Economic Benefits of Investing in Clean Energy, Political Economy Research Institute and Center for American Progress (2009), pages 28-29. http://www.americanprogress.org/wp-content/uploads/issues/2009/06/pdf/peri_report.pdf. This study uses an input-output model (IMPLAN 2.0 software and IMPLAN 2007 data set) to estimate job creation. Detailed methodology is described in Appendix 1, pages 50-56. Zabin et al., same as footnote #13. Pollin et al. (2009), pages 28-29. J.R. DeShazo, Colleen Callahan and Elizabeth Beryt, Achieving Proposition 39’s Clean Energy Promise: Investing in Jobs, Energy Efficiency, and Renewable Resources. UCLA Luskin Center for Innovation and the Los Angeles Business Council Institute, (April 2013), page 10. http://innovation.luskin.ucla.edu/sites/default/files/Prop%2039%20Supporting%20Report%20-%20Final.pdf. Leveraging will also reduce the number of induced jobs created from redirecting utility bill expenditures to other uses, because loans must be repaid. Total investment amount assumes 4x multiplier for revolving loan fund based on findings from DeShazo et al. that a revolving loan fund capitalized with $50 million per year would quadruple the total investment and jobs compared to the same amount spent through a grants program. Uyen Le, Project Labor Agreements: Pathways to Business Ownership and Workforce Development in Los Angeles, UCLA Labor Center: California Construction Academy, (November 2011), pages 18-20. http://constructionacademy.org/wp-content/uploads/downloads/2012/03/LAUSD-PSA-Small-Business-Participation-CCA-11-18-11.pdf. HVAC Contractor Ordered to Pay Nearly $1M for Violating Labor Law Indoor Comfort News, (March 2013), page 1. http://www.airtro.com/wp-content/uploads/2013/02/IHACI-interview.pdf. Zabin et al., pages xi-xiii, 71-75. We mapped the distribution of occupations from our analysis of the industries engaged in energy efficiency and distributed generation using the Bureau of Labor Statistics O NETs database. Zabin et al., pages xi-xiii, 71-75. California Labor Code, Division 2, Part 7, Chapter 1, Article 2, Section 1777.5(g). Veterans in particular, who may already have construction trades skills, may be able get credit from your military experience to enter apprenticeship at an advanced level through the “Helmets to Hardhats” program. See http://www.helmetstohardhats.org/. For a breakdown on the numbers and types of public K-12 schools in CA, see Kate Gordon and James Barba, Proposition 39: Investing in California’s Future, The Center for the Next Generation, (December 2012), page 2. http://thenextgeneration.org/files/Prop39_Investing_In_California.pdf . Building energy performance is also impacted by contractors with service contracts for periodic building recommissioning to ensure proper operation of systems such as lighting or HVAC. California School Employees Association Maintenance & Operations Counts by Chapter and Employer Including Job Titles (April 18, 2013). We base this estimate on data obtained from the California School Employees Association (CSEA) for maintenance and operations workers in over 700 school districts. This data included job titles for 57 percent of maintenance and operations workers represented by CSEA, which we used to estimate the number of workers statewide in jobs related to projects eligible for Proposition 39 funding. CSEA represents roughly two-thirds of classified school employee workforce statewide, so we assumed the maintenance and operations workers that they represent account for roughly two-thirds of this workforce statewide. California School Employee Association and Association of California School Administrators, California Classified Employee Compensation Survey (2011). Categories are based on our analysis of maintenance and operations job titles for CSEA members. Each category includes a range of related job titles. Estimates are based on our analysis of maintenance and operations workers represented by CSEA. Statewide, CSEA represents roughly two-thirds of the school classified employee workforce. Zabin et al., page xxii; and 2012, Final Report for the California Clean Energy Workforce Training Program, Employment Development Department, Contract Agreement Number: 180-09-001 (2012). U.S. Department of Labor Employment and Training Administration, Training and Employment Notice No. 13-12 Defining a Quality Pre-Apprenticeship Program and Related Tools and Resources, (November 30, 2012), http://wdr.doleta.gov/directives/attach/TEN/TEN_13-12.pdf. YouthBuild USA, Directory of YouthBuild Programs. https://www.youthbuild.org/siteview?state=CA. California YouthBuild Coalition, About Us. http://www.youthbuildca.org/about-us/. California Conservation Corps, About Us. http://www.ccc.ca.gov/about/Pages/aboutus.aspx. Helmets to Hardhats is a national, nonprofit program that connects National Guard, Reserve, retired and transitioning active-duty military service members with skilled training and quality career opportunities in the construction industry. For more information, see http://www.helmetstohardhats.org/. RichmondBUILD is a public private partnership focused on developing talent and skill in the high growth, high wage construction and renewable energy fields. For more information, see http://www.ci.richmond.ca.us/index.aspx?nid=1243. The Cypress Mandela Training Center is a community based organization dedicated to improving the lives of the people it serves by providing pre-apprentice construction and life skills training along with employment assistance. For more information, see http://www.cypressmandela.org/. The Los Angeles Unified School District “We Build” Program provides local District residents with an opportunity to enroll in a comprehensive, ten-week pre-apprenticeship training program offered at Adult & Career Education Occupational/Skills Centers. Upon completion, “We Build” graduates are competitively positioned for placement on an LAUSD construction project through its contractors and the local trade unions. For more information, see http://www.laschools.org/new-site/we-build/. This range is based on estimated costs per trainee from a sample of pre-apprenticeship programs including (a) RichmondBUILD ($4,400-4,600 per trainee) from State of California Employment Training Panel, Training Proposal for: City of Richmond Workforce Investment Board, Agreement Number: ET13-0179 (October 19, 2012) page 2. http://www.etp.ca.gov/packet/City%20of%20Richmond%20-%20130.pdf; (b) Northern California Construction & Training, Inc. ($5,200 per trainee) from State of California Employment Training Panel, Training Proposal for: Northern California Construction & Training, Inc., Agreement Number: ET12-0238 (December 16, 2011) page 2. http://www.etp.ca.gov/packet/No%20CA%20Construction%201301.pdf; and (c) YouthBuild ($15,000 per trainee) from U.S. Department of Housing and Urban Development, Office of Policy Development and Research, Evaluation of the Youthbuild Program (August 2003), page 13. http://www.huduser.org/Publications/PDF/YouthBuild.pdf. This estimate is based on an 80 percent completion rate among 125 trainees, resulting in 100 trainees completing from the program. 125 trainees times $15,000 equals $1.875 million. For examples of targeted hire policies and outcomes, see Partnership for Working Families: http://www.forworkingfamilies.org/resources/policy-tools-targeted-hiring-permanent-jobs. The Building Operator Certification is a training and certification program for facilities personnel to improve job skills and knowledge related to building operations. See: http://www.theboc.info/. Navigant Consulting, Program Year 3 DCEO Building Operator Certification Program Evaluation Presented to The Illinois Department of Commerce and Economic Opportunity, (May 15, 2012), pages 31-32, http://www.theboc.info/pdf/2012_Illinois-DCEO-BOC-Evaluation.pdf. Interview with Bob Johnson, CSEA Field Operations Manager (April 16, 2013). Courses are taught by experts from the skilled trades apprenticeship and journey-level schools, state and federal certified trainers, school district administrators, community colleges and private industry trainers on topics such as OSHA 10 Training and Certification, HVAC Maintenance, Green Cleaning, Electrical Safety, and Basic Carpentry. For more information, see: http://members.csea.com/memberhome/Events/MaintenanceandOperationsAcademy/tabid/783/Default.aspx. Correspondence with Bob Johnson, CSEA Field Operations Manager (April 22, 2013). City of Los Angeles Workforce Investment Board, Building a Stronger Los Angeles Workforce: Highlighting Eight Years of Collaboration 2005-2013, pages 16-17 and 30, http://www.wiblacity.org/images/stories/PDF/wib_buildingstrongerworkforce_april2013.pdf. Zabin et al., page xi.